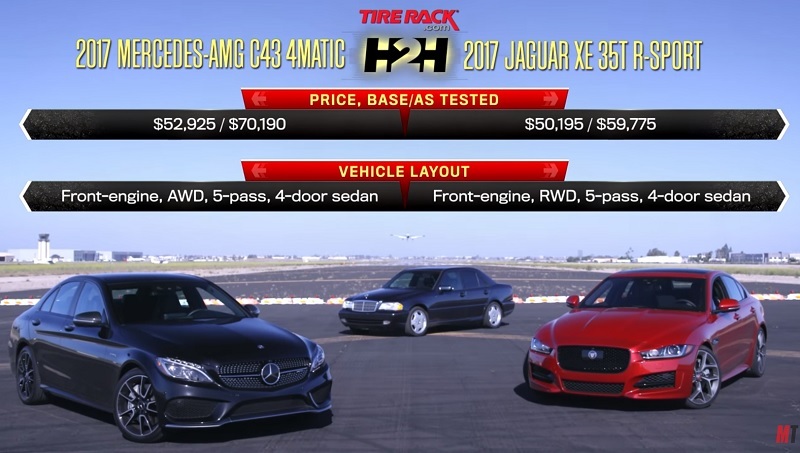 Motor Trend hosts Jonny Lieberman and Jason Cammisa decided to pit two of the best small sport sedans against each other in a head-to-head battle; the 2017 Jaguar XE 35t versus the new 2017 Mercedes-AMG C43. Generally, the title of the best luxury performance sedan is usually held by a German brands until Jaguar entered the scene. Way back in 2015 the Jaguar XE went toe-to-toe with BMW’s 335i M Sport and came out as the new title holder, now the sporty four-door saloon will have to defend its spot against the Mercedes-AMG C43. Already on sale in the UK, Mercedes’ sedan version of the turbocharged 3.0-litre V6 coupe can deliver 367 horsepower and 384 lb-ft of torque, that’s enough to launch it from 0-62mph in just 4.7 seconds when combined with a nine-speed automatic gearbox and four wheel drive. Defending its title is the Jaguar XE, which the automaker claims to be the ultimate sports saloon. Powered by a supercharged 3.0-liter V6 and paired with a ZF eight-speed automatic, the Jaguar XE can send 340 hp and 332 lb-ft of torque to its rear wheels. After taking the Jaguar and Mercedes-AMG through some twisty back roads, both hosts came to similar conclusions; the XE 35T is a great driver’s car to for canyon carving and it has one of the best chassis in the segment. On the other hand, the AMG C43 is fast and a blast to drive. What does everyone think of this new rivalry? they actually brought in some great perspective when just targeting the regular a-to-b driver that won't see twisty roads. truth is this segment much like many other car segments and even smartphones segments, washing machine segments, etc. sometimes it comes down to brand. to me the XE is the Jaguar 3-Series i always wanted....simply put.